Reaching beyond Western stereotypes, women's dances of the Islamic world reflect a diversity of styles and purposes. From celebration to courtship or devotion, dance plays a vital role in community identity as well as self-expression. 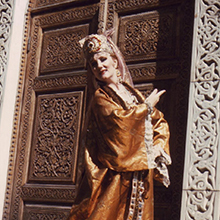 Award-winning dance scholar, choreographer, costume designer, and performer Dr. Laurel Victoria Gray specializes in dances from Silk Road cultures and beyond. Gray teaches world dance at GW and is the founding artistic director of the Silk Road Dance Company. This half-hour lecture, followed by informal discussion, is part of a series led by GW faculty and other experts. A collaboration with the Arts Initiative Committee of GW.